Engineering student Kramay Patel’s invention not only helps conserve resources but also underscores how U of T enables innovation. 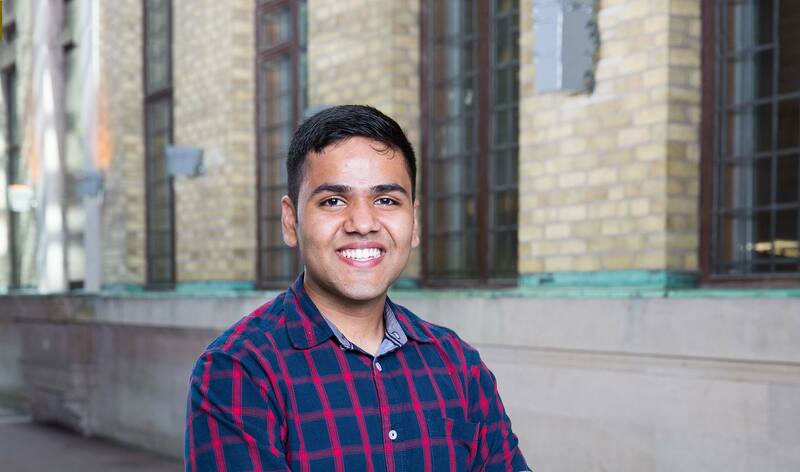 In just his second year at U of T, biomedical systems engineering student Kramay Patel invented a showerhead that tracks your water use and even talks to you. “The idea came about because every time I take a shower my parents yell that I take too long,” Patel explains. He and classmate Akash Goel tapped into the same concept used by apps such as Fitbit—helping people change behaviours by providing concrete feedback. Their smart showerhead can tell you how long you’ve been in the shower, how much energy you’re using, and how much you’ve saved (or spent) over time. Patel and Goel not only won the Sustainable Engineers Association’s Case Competition, but filed for a patent and incorporated as Kreeate Corp. The Faculty of Applied Science & Engineering’s Hatchery business accelerator was extremely helpful in getting the idea off the ground. And Patel was so energized by the process that he went on to join the Sustainable Engineers Association, becoming co-president, and organizing “Translating Ideas to Impact”—the club’s one-day conference that invites government and industry leaders from all over Toronto to discuss ways to improve the city’s sustainability. Patel also worked with Prof. Milos Popovic of the Institute of Biomaterials & Biomedical Engineering, who pioneered functional electrical stimulation. This technology uses small electrical currents to artificially contract muscles. Patel expanded the idea to build a “neuroprosthesis” that could replace a wheelchair seatbelt. “If you’re accelerating forward, you tend to fall backwards, so we contract your ab muscles,” he says. “And then when you decelerate, your tendency is to fall forward, so we contract your back muscles.” The invention is designed to help improve the independence of people with spinal cord injuries. In between, he also managed to work on the executive of RSX–Robotics for Space Exploration. The student club enters international robotics competitions and has already built a working Mars rover and a can-sized satellite.